Is Mitch McConnell panicking? It sure looks that way. The debt ceiling proposal he released yesterday afternoon confused pretty much everybody, including yours truly. But stripped to its bare essence it’s actually quite simple: Congress would give President Obama the authority to make good on the country’s debts, without imposing any binding policy constraints. This is, more or less, what Obama wanted originally and what Republicans have been saying they wouldn’t give him. 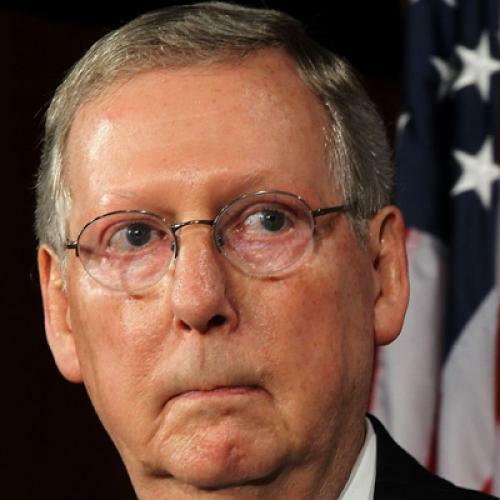 Perhaps McConnell is listening to business leaders nervous that Congress will leave the current debt ceiling in place, causing the U.S. to delay some government payments and potentially causing a financial crisis that could quickly spread around the world. Perhaps McConnell is watching the polls and noticing that voters don’t share his party’s aversion to taxes on the wealthy. Or perhaps it’s some combination of those and other factors. Whatever the reason, he’s clearly very worried. Otherwise he wouldn’t have made such an offer in the first place. Of course, McConnell has designed his proposal so that it will inflict maximum political pain, or what he thinks will be maximum political pain, on the Democrats – by, among other things, forcing those who serve in Congress to vote to raise the debt ceiling. And who knows, it might work: Gaming out the possibilities is too complicated for me. But first McConnell must convince the rest of his party, particularly those who serve in the House of Representatives, to go along. And as of this writing that seems like it will be awfully difficult. Back in 2010 when the Chamber of Commerce and other business-oriented groups were cheering for -- and helping to fund -- a GOP takeover of the House, they were warned to be careful what they wished for. These were not your father's Republicans, but a breed of anti-Washington, anti-establishment activists who weren't interested in the status quo or the agenda of the business elites. And, they've proven that this week. Despite the intentions of Speaker Boehner and Minority Leader McConnell to cut deals, the reality is that this GOP conference isn't going to be swayed by the "establishment" doom and gloom scenarios." We’re looking at the very real possibility that the top two Republicans in Congress — the Senate Minority Leader and the Speaker of the House — have no meaningful influence over how their caucuses resolve a crisis of their own making. It would be satisfying and, yes, a little entertaining to watch the Republican revolution consume the party’s leadership in this way, if only the stakes weren’t so high.